Your Athletics are down by a run, so turn up the crowd noise and cheer all you can! Make sure they come out with a win in this Oakland Athletics Dial It Up T-Shirt! 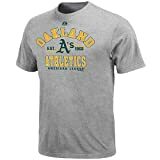 Features a vibrantly colored Oakland Athletics graphic front and center that is the perfect addition to any Athletics fan’s apparel collection. This entry was posted on April 3, 2012 at 3:53 pm and is filed under Oakland Athletics. You can follow any responses to this entry through the RSS 2.0 feed.